Domesday-Book is an ancient record or register, drawn up by order of King William the Conqueror, and contains a general survey of nearly the whole of the landed property of the kingdom. It was begun in the year 1080, and completed in 1086: commissioners were sent into every county, and juries summoned and impannelled in each hundred, out of all orders of freemen, from barons down to the lowest farmers, to give in upon oath to the commissioners, by verdict or presentment, due information, for the faithful and impartial execution of it. In the description of the manors and possessions it is generally stated, how many hides or carucates the land is gelded or taxed at - whose it was in the time of King Edward - who the present owner and sub-tenants - what and how much arable land, meadow, pasture and wood, there is. Alderton was mentioned in the Doomsday book as Aldritone or the "Town of Alder". There are two mentions on the page below. Households: 5 villagers. 8 smallholders. 1 riding men. 1 burgess. Lords in 1066: Dunning; thane, one. Lord in 1086: Humphrey (the chamberlain). Places mentioned in this entry: Alderton; Dixton; Hentage. 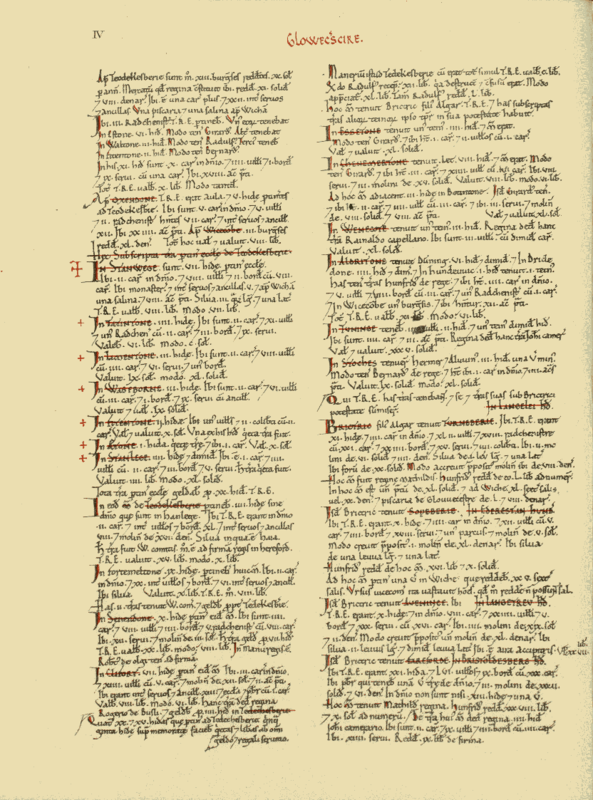 Open Domesday has links to the full Domesday Book and images of all of the original pages. The button below takes you to the page on Gloucestershire where Alderton is mentioned.